You are a young person, on the threshold of adulthood, living in the splendid walled city of Troy. Troy is besieged. It has proudly withstood the siege for nearly ten years, but the strain is now beginning to tell. All the wealth has gone to pay for the war and food is short. Every day the great city gate is opened and Trojan warriors, young and experienced alike, pour out onto the plain to do battle with the Greek oppressors. You can watch all the drama from the city walls, if you can stand it. Imagine the nervous strain. Will you ever see your friend or loved one again if he goes out through the Skaian Gate? Do you want to watch him die on the battlefield? How can you grow up in this atmosphere? Why are so many lives being blighted by war? Why are so many good men dying? Well, Prince Paris of Troy, extremely handsome and a bit wayward, heard a rumour that Helen of Sparta was the most beautiful woman in the world and he set off to find her and have a look for himself. It turned out that she really was something special and the pair of them eloped and came back to Troy to live. This despite the fact that Helen was already married to Menelaus and had three children. Menelaus felt he'd been made to look a bit of a fool, so he called on his allies and set off to do battle with Troy. I think if I'd been Paris's mother, Queen Hecuba, I would have told Paris to take his new woman off somewhere else, but Paris's father, King Priam, thought Helen was marvelous and vowed to keep her at Troy. And so the scene is set for a bloody confrontation. It's an old story and Adele Geras is faithful to the texts. What she offers is a fresh insight into the minds of the characters - how they resign themselves to the most outrageous turns of fortune, with a shrug of their shoulders, knowing that mortals are just the playthings of the gods. And we do actually get to meet the gods as they move among the men and women of Troy. The gods even discuss matters with their chief playthings, which is handy for us as readers, but absolutely no use to the characters concerned since they can remember nothing of the encounter two minutes later. It's a strange kind of philosophy isn't it, that allows you to say 'Ah well, it's all in the lap of the gods' because that immediately absolves you from all personal responsibility for your actions. So, Xanthe and Marpessa, sisters and handmaidens in the royal households of Troy, resolutely squabble over the same young chap, blaming it all on Eros and Aphrodite. There's a lot going on in this story, what with the interminable love triangles generated by the gods and the bitter war being fought by the super-heroes out on the plain. Adele Geras makes everyone seem terribly human and vulnerable. And in a way, she is able to build on the fact that it is such an ancient story. That wooden horse trick is so simple and we know it so well, I could hardly believe that the Trojans were really going to fall for it this time. But they do, and the results are devastating. 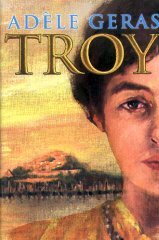 The sacking of Troy is an extremely powerful piece of writing.